Urban Pole in the U.P. It’s no secret that I have been working my twisted handgrip for a good long while – every class, I knock a few out, looking for that elusive lock, especially on the pencil. Some weeks, it feels solid; other weeks, I struggle to get it to go. This week, I found myself repeatedly listing to one side in the ayesha, but couldn’t correct the swerve – the counter balancing was not happening. Naturally, I was frustrated, but hey, that is the nature of working a trick. Cut to our class freestyle, where I busted out my twisted handgrip ayesha and held it with no problem, then took it up to pencil!!!!! It worked all of the sudden – maybe it was the flow of the moment in the song, I don’t know – but it was awesome. I was so thrilled. Little victories, y’all. Savor them. Recently, I’ve been tracking my diet and exercise with the MyFitnessPal app (HaloFive00 if anyone wants to be my pal! ), and every time I have to enter a pole class in the exercise portion, I’m stumped. Is it closest to Yoga? Pilates? Dance? Calisthenics? How do I choose which exercise fits best, and therefore, get an accurate count on calories burned? The same is true for lyra – and even my stretching class, because let’s face it, I am a sweaty mess afterward, so I know I’m working SOMETHING off. I did some research over the last few days, looking up and comparing a few different exercise trackers, like the Fitbit and the Nike+ Fuelband. I was set to buy the Fitbit, because I liked that it has a function that will track your sleeping habits (i.e. how many times you wake up through the night), and it syncs with MyFitnessPal – it also has MUCH higher reviews on Amazon than the Nike+ Fuelband (a helpful comparison can be found here). But, after digging a little more, I realized that both units have the same issue – they don’t read movement other than walking/running/stepping very well. There were complaints on both sides about the inaccuracies of the reads, although Fitbit allows you to input your own data on their site. As a result, I did research on heart rate monitors, thinking that might be the best way to gauge what I am doing in classes. I found one on Amazon with a stellar rating and read the reviews – more than a few mentioned that the users wore the monitor in a variety of classes (spin, Zumba), and that it did well in those environments. So, I opted to purchase it! If you’re interested, the model is the Polar Ft40F Women’s Heart Rate Monitor Watch (in white). I will keep you posted on what my totals are once I receive it and get it set up! I had a weird thought the other day, while in my stretch and flex class at CH. During the class, you obviously do a ton of stretching, but each class focuses a little more on one thing or the other, depending on what the instructor plans for the day. This week, we worked a lot on our splits and backs. Now, I am not terribly flexible. I have *some* flexibility in doing a seated splay on the floor and folding over it, to try to get my chest to the floor. But, in most respects, I am not flexible. My back, shoulders, legs, hips…not flexy. I have strength, I have a reasonable amount of grace (or so I am told – I point my toes most of the time! ), but flexibility is not my strong suit. Anyway, we were doing a stretch on our backs, pulling one straightened leg up and as close to our chests/faces as we could, and I caught myself just staring at my foot. Really staring at it. Moving it this way and that, looking at the tendons move, etc. And – even if this makes me sound like a lunatic – I kind of fell in love with it. Here’s the thing: to be an artist is to learn how to express through a given instrument. I don’t care what kind of art you do – it’s a form of expression. For some folks, their instrument is a pen, or a paint brush; for others, it’s a computer; others, it’s a guitar or an oboe; for some, it’s their voice, through song or spoken words; writers of all kinds, actors, dancers…whatever type of artist you are, there is some kind of instrument that allows you to release your expression into the world. I think that the best way to tap into that is to fall in love with whatever your instrument might be – and to connect with it, and yourself, in such a way that the expression is fluid. But, in that moment, I was totally in love with my foot. I went through the rest of the class amazed by all of the things our bodies could do, but most of all, what my body did. I was surprised and challenged and thrilled by all of it. I think that will be one of my things to keep in mind, from here on forward: take the chance to be present and fall in love with my body every time I am in a class, even if it’s piece by piece. 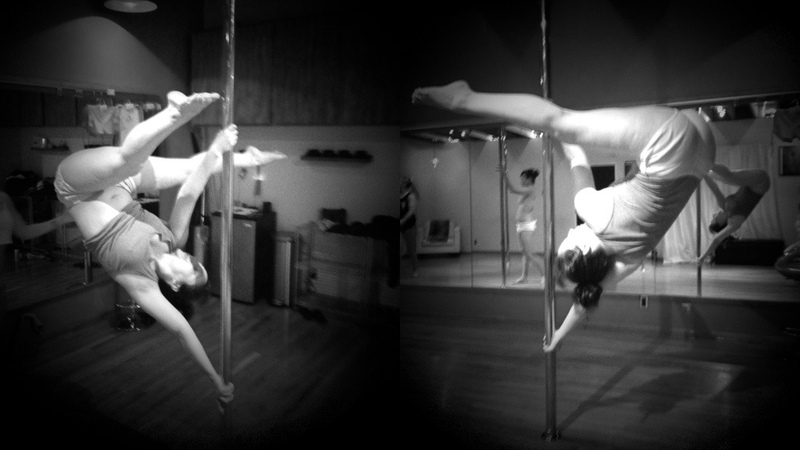 Sometimes, pole can be so challenging that it feels antagonistic, so a little love could go a long way. You like me! I like lyra! Everyone likes The Last Goodbye! Stunning, yes? I adore Marlo. I had never seen Kyle before, but he’s wonderful. Been back at it in my own class, doing some review (thanks for the bruises, Teddy Bear), as well as working on some newer stuff – we learned a spin that was spotted in an Oona routine, which I shocked myself by getting fairly quickly, even if I’m not quite as graceful about as Oona. 🙂 Keeping up the work on my aerial…slowly, but surely…and working on my reverse shoulder mount. My regular shoulder mount seems to have up and left me, which I’ll post about soon. I have stretch & flex class tonight, and two lyra classes over the weekend, then pole and stretch & flex next week…then, vacation! Hrm, maybe I can get a decent urban pole photo while I am gone! My pole-related business venture is inching closer to fruition – I promise to post all of the info as soon as we’re set up! I was also convinced to start work on a creative endeavor related to pole, so once I have more done on that, I’ll share some specifics! Quick Survey – stretch & flex – shoulder mount! Hey Polers – would you please take a few minutes to fill out this survey for me? We’re working to get our pole apparel line up and running, and this survey will help us focus on what everyone out there is looking for in their choices for pole shirts/tanks/shorts, etc! If you’ve got any pole sisters (or brothers! ), please share it with them as well! THANK YOU! Stunning, yes? At 61 years old, she does things I wish I could do – and I am half her age!! What an inspiration!! Greta also competed at PPC 2012 and placed 2nd in her category, although I did not get to see her performance while I was there (it was a crazy day, since I was also competing). I love her grace! 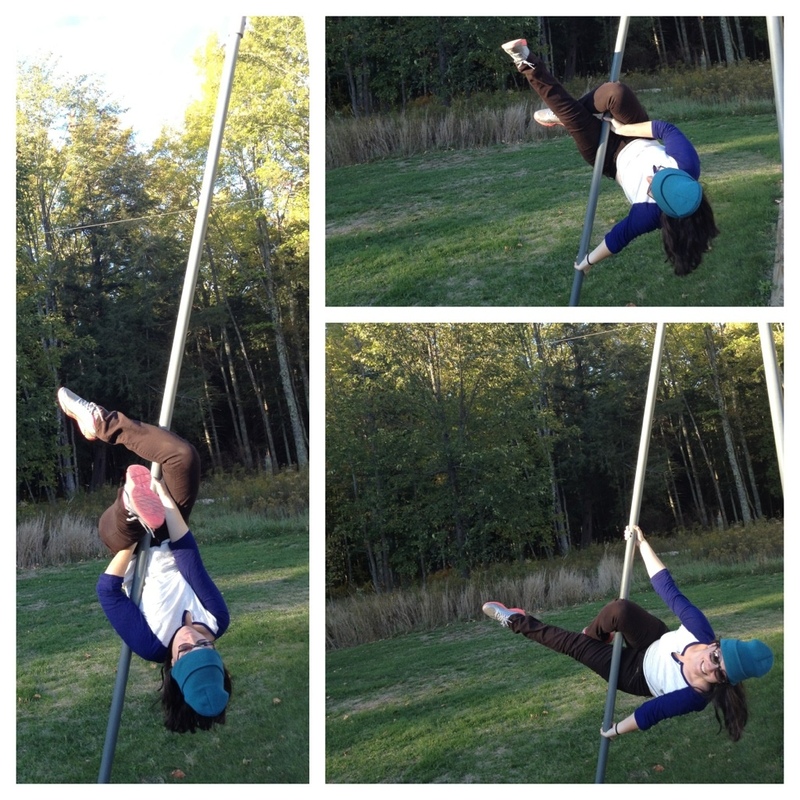 I think that Greta can be an inspiration to any pole dancer. Whether you are just finding pole, or are a champion yourself (I originally saw her video because it was posted by Natasha Wang), Greta is someone worthy of a pole-crush! Pole World News has a lovely article about Greta, which I encourage you to read. You can also find out more about her on her website, http://aerial-zen.com.